Hi there! Today, I'm focusing one image from the Dachshunds stamp set to be the main focus of the card. It's a bit unexpected since this set is mainly about the dogs and I'm using just the balloon. I wanted to use Kraft paper for the card along with colored pencils. I used a pigment ink and full adhesive Post-its to stamp and add multiple balloons to the card. Using colored pencils, I laid down some white colored pencils where I wanted the highlight of the balloon to be. I used two similar color shades, using the darker one for the edge of the balloon and the lighter one for the interior. These colored pencils blend quite easily. Placing the highlight down really helps the color pop and I only lightly go over it with the lighter shade. 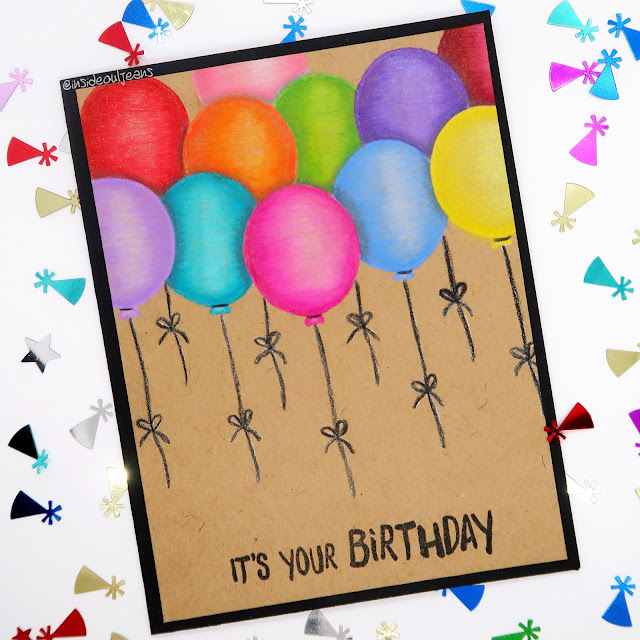 It is such a simple card but all the colors of the balloons really pop. I really loved how it turned out. 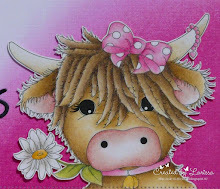 Goodmorning, I am Larissa from Car-d-elicious and today I am posting a new card for Gerda Steiner designs. 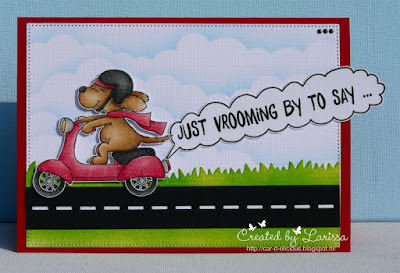 This time I made a card with the digital stamp Dog on scooter - Vrooming by from Gerda Steiner designs. I have coloured the image with my Polychromos pencils and then I have fussy cut the image. With the Crea-nest-lies XXL 52 from Crealies I have die-cut a rectangle from white cardstock. I added a cloudy background on it with Tumbled glass distress ink and the Mini cloud edges stencil from My favorite things. From black cardstock I have die-cut a road with the Open road die-namics from My favorite things. I used the Grassy hills die-namics from My favorite things to die-cut some grass from white cardstock. I coloured the grass with Twisted citron and Mowed lawn distress ink. After I adhered the grass and the road on the rectangle, I adhered the image with foamtape on the card. I printed the sentimen on white cardstock and then I made a sort of cloud around it with a black pen. I have fussy cut the sentiment and adhered it on the card. I decorated the card with black hotfix gems. I finished the sentiment on the front of the card on the inside of the card. 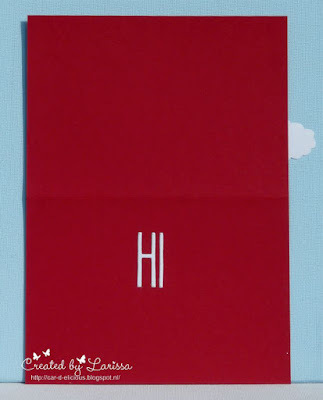 I have die-cut the word hi with the Journaling alpha dies from Neat and tangled and then I adhered it inside the card. Hey stampers, Anni here again with another card using the super cute set Wheek, Wheek, Wheek...Guinea Pig! I started by creating masks for nearly all the guinea pigs in the set. Then I stamped the guinea pig in a row. I just wanted to use the uper part of the critters so I didn't mind how the rest looked. For inking the stamps I used alcohol marker friendly ink because I wanted to colour with Copic markers. To create a variety of fur I searched at Google for picture of guinea pigs to see in which colours they come. Just like on the last card I added some strokes of coloured pencils and white gel pen to achieve a more realistic look. To cover up the bottom part of the guinea pigs I created a panel with a scalloped border - a little bit looking like a fence. I tied a little bit of twine around it. I finished up the card by stamping the punny sentiment and assembling the card. Thanks for stopping by. Again it was so much fun to be a guest designer for Gerda Steiner Designs. Hello everyone! It's been awhile since I've shared one of my cards and I really am loving this one. If you're a fan of animals, especially doggies, this Dachshunds stamp set is for you! 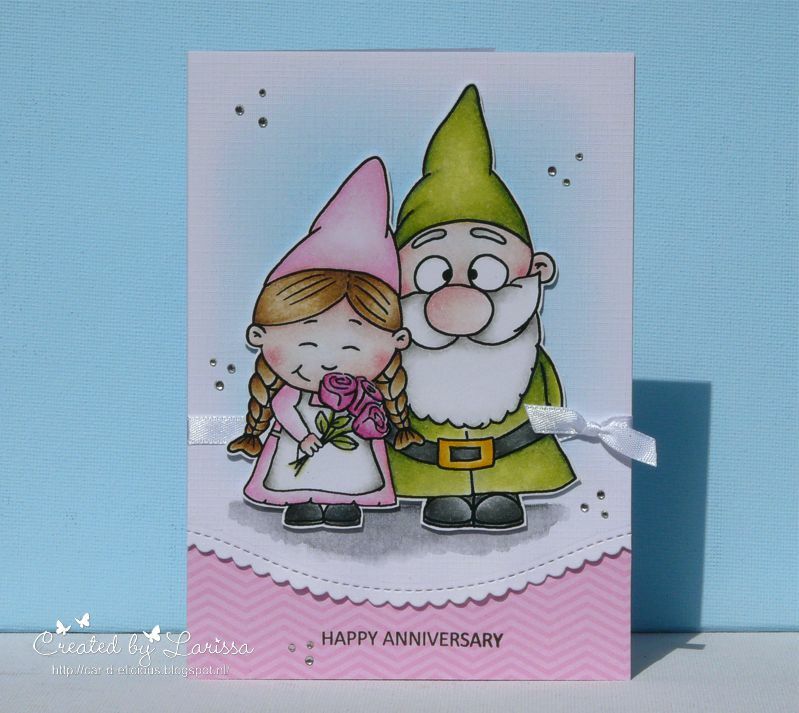 You'll see that I used the Hoppiness stamp set as well to add a few extra elements to the card as well. I used a grassy hills die to create a stencil. Using distress inks, I colored two layers of the grass. I definitely wanted to use two of the dogs in the set. I like how the first dog is looking back. I can't really tell if he's looking at that butterfly on his tail or the other dog chasing the tennis ball. Since the second dog looked to be moving, I wanted to put him in action. And what dog doesn't love chasing balls? I just had to have him chase the tennis ball included in this set. I create a pull tab channel so he could run towards the ball. I used two sentiments in this card: It's Your Birthday and Have A Ball. The first one is prominent on the front of the card, but the second one is hidden until the dog fetches the ball. It's a small surprise for the card recipient. I used the hearts and the butterfly from the Hoppiness set so I could add pop of color to the card. It looked a little too plain with just the doggies. I think it helps add that special something to the card. I hope you enjoyed this card and picked up the set. It's so fun! Thanks for stopping by! Hi Its Hazel from Didos Designs back again with another card made using the adorable Dachshunds Stamp Set. 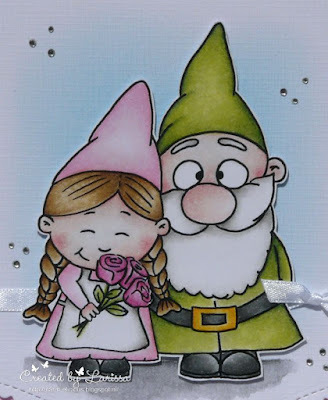 I love this card as it makes me think of my Belle. (Although shes a Jack Russell) She loves to play with the ball. Its something she would do all day everyday!! 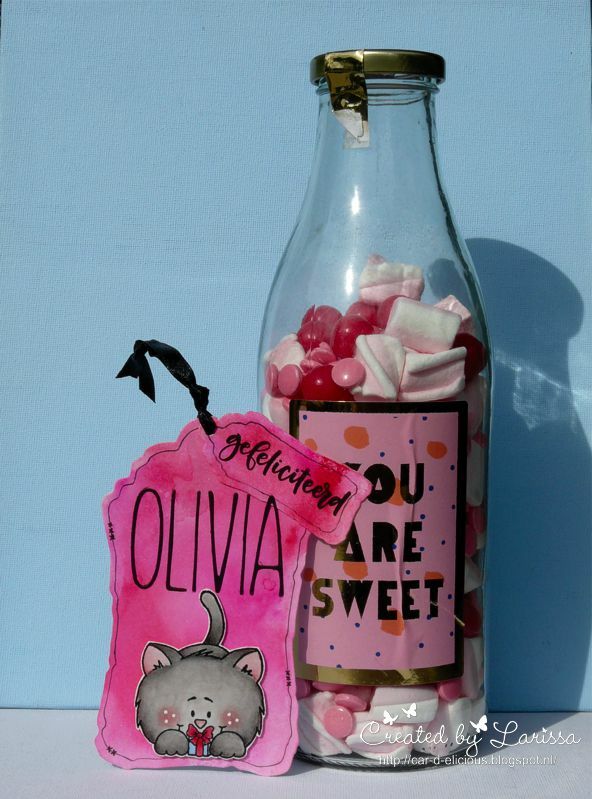 My card has been made with a little help from my recycling!! I saw the background of the polaroid on one of the easter eggs we had and thought it would look grand on a card. So here we are with it cut out along with a png image of a polaroid picture. 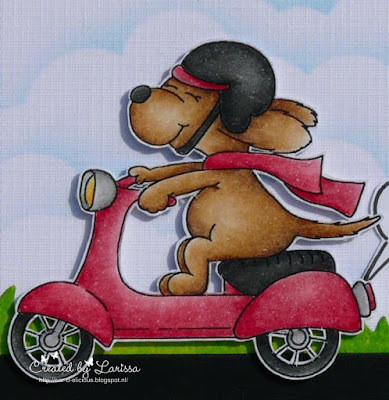 One happy doggy stamped and colored with spectrum noir pens and the card was complete. 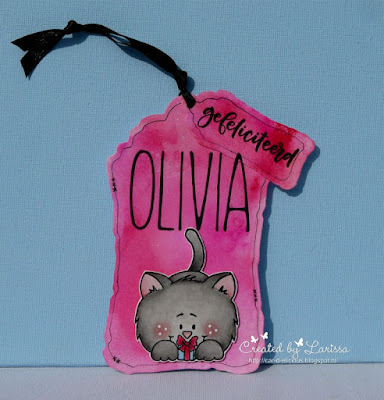 Labels: Dachshunds, dog, Guest Designer - Hazel (Didos), Spectrum Noir Markers, Stamps. Cute. I am so happy to be back again as a guest designer for Gerda Steiner Designs. And I played with this super cute set called Wheek, Wheek, Wheek...Guinea Pig - and I had so much fun. I started by stamping one of the guinea pigs and all the lettuce leaves and tomatoes. For the colouring I used alcohol markers. To colour the guinea pig I added strokes to the image and didn't blend them to achieve the look of fur. To take it even a step further I also added some details with coloured pencils and a white gel pen. I fussy cut the images and set them aside. For the background I die cut a rectangle from white cardstock and blended some turquoise and blue ink onto the panel. Some spritzer of water to add a little bit of intrest to the "sky" and my background was finished. I chose one of the punny sentiments from the set, heat embossed it in white on a stripe of black card stock. Thean I arrenged everything on my cardbase and that finished up my card. I will be back next Monday with another card! 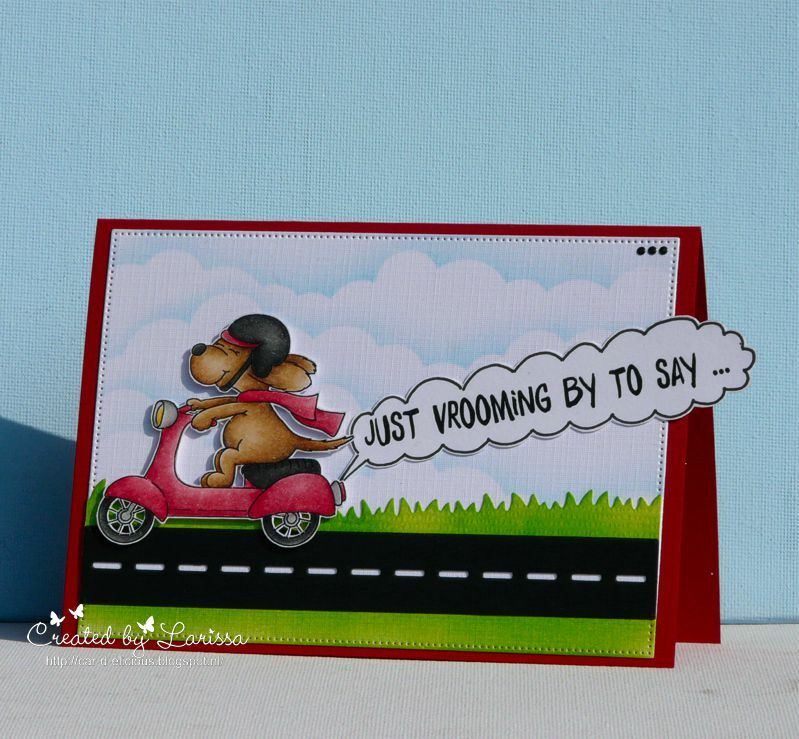 Hi Everyone, Its Hazel from Didos Designs here today with a card made using the fabby Wheek Wheek Wheek Stamp set. Love this little guy, He looks adorable. I coloured him in using spectrum noir pens and then added his fur detail with prismacolor pencils. I fussy cut his lettuce leaves. you can buy an add on die cutting set to save yourself from having to cut out here. How cute is this wee guy!!! There are lots of doggys in the collection and some fabby woofy sentiments as well. I have used a die cut frame for this card and fussy cut one of the dogs out to be sitting in it. I added the I Ruff you sentiment to finish the card off. The store is currently closed till the 7th while Gerda and Macy have a well deserved Easter Break. 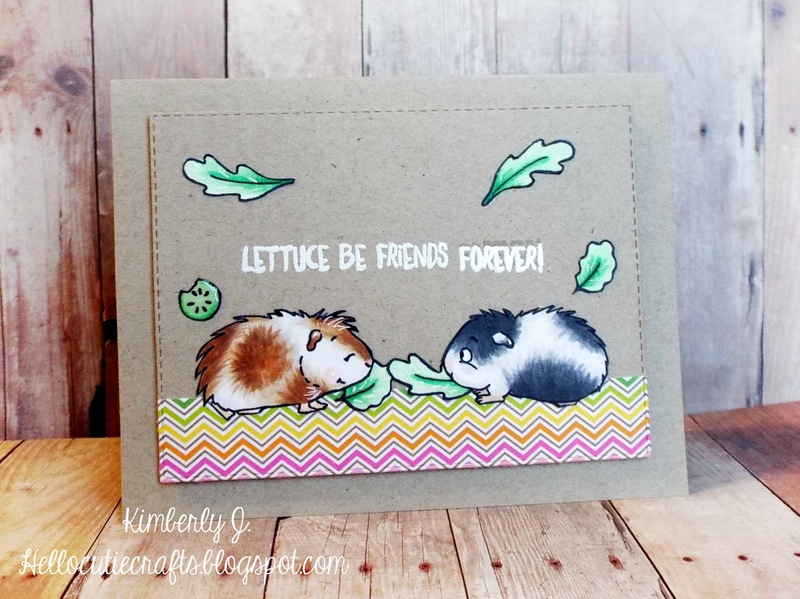 Lettuce Be Friends- Guest Designer Kimberly J.
Kimberly from Hello Cutie Crafts here today to share a card. Wheek, Wheek, Wheek stamp set by Gerda Steiner Designs. I started with a kraft card base from Desert Storm(Neenah) cardstock. I also die cut a stitched rectangle panel with a border strip from the Hello Sunshine 6x6 paper pad (Doodlebug Designs) for the cute guinea pigs to sit on. Next, I stamped the sentiment and heat embossed it in white. Then, I added the colored images to the card. Finished the card with some white gel pen and glossy accents in a few places. 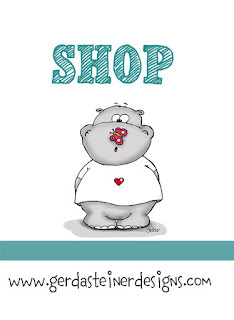 Make sure to check out the Gerda Steiner Designs store! 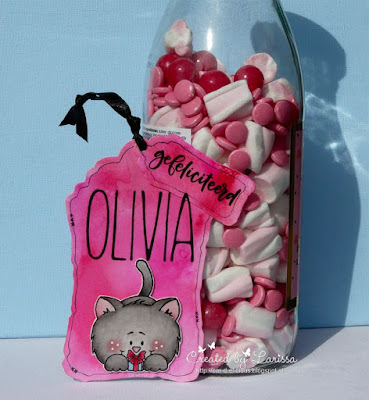 Goodmorning, I am Larissa from Car-d-elicious and today I made a card for the monthly challenge from Gerda Steiner designs. This month you have to make a card with the image Gnome couple from Gerda Steiner designs. If you buy this image and make a card with it, you automatically get the image for next month for free. 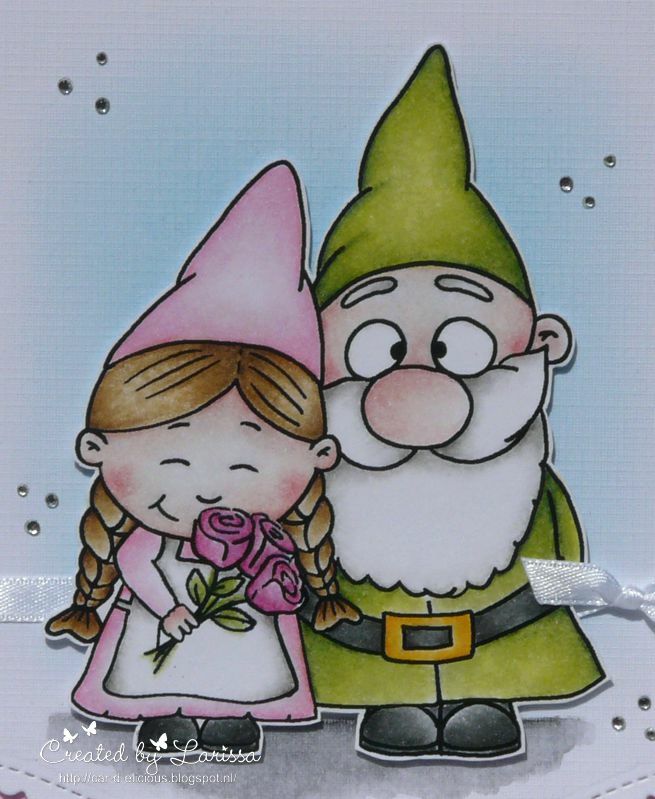 I have coloured the image Gnome couple from Gerda Steiner designs with my Polychromos pencils and then I have fussy cut the image. I have die-cut the bottom of a piece of a white cardstock with the Stitched scallop basic edges 2 die-namics from My favorite things. I made background for the image with a black Derwent aquatone pencil and then I coloured the background with Tumbled glass distress ink.I tied a white ribbon around it. 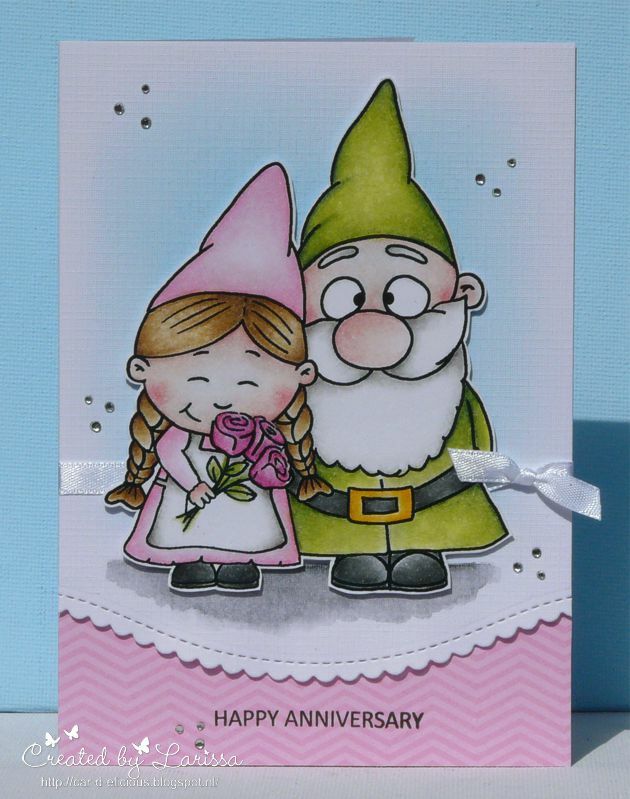 On a white card I adhered a piece of pink designer paper from the Sweet celebration paper pack from My favorite things and then I adhered the white cardstock with foamtape on the card. On the pink design paper I stamped a sentiment from the set Tiny type from Clearly besotted stamps. 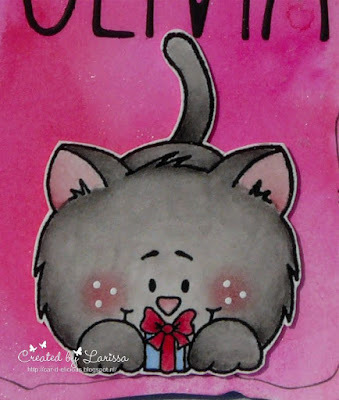 Then I decorated the card with crystal hotfix gems. Hi, Its Hazel from Didos Designs here with a card Ive made using the super cute Wheek Wheek Wheek Guinea Pig Stamp set. 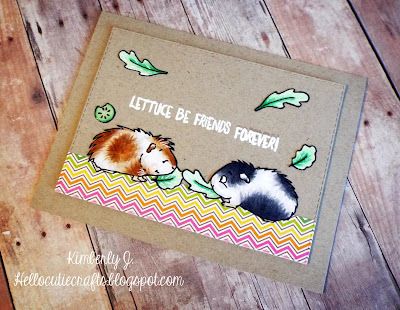 For this card I randomly stamped the lettuce and cucumber on a piece of card and coloured them with promarkers. Next I fussy cut the wee Guinea Pig out and colored him in with promarkers as well. Finally matted the card up and added the sentiment to the top. The store is closed until the 6th while Gerda and Macy have a lovely break.